Warm, waterproof and designed to protect against bad weather wherever it finds you, the Stratus Transcend Hooded Jacket combines technical materials to keep you warm and dry whether you’re at home or away. The Stratus’ waterproof and breathable stretch 2-layer shell fabric is fully seam sealed to keep out moisture, while the jacket’s 70g MerinoLOFT™ insulation provides a lofty and sustainable alternative to synthetic fills that keeps you warm even when wet. Icebreaker also lined the body and the hood with 100% merino wool jersey fabric for incredible next-to-skin comfort. The adjustable hood and internal storm cuffs offer additional protection, while zippered hand and chest pockets keep your phone, wallet and other essentials dry and secure. 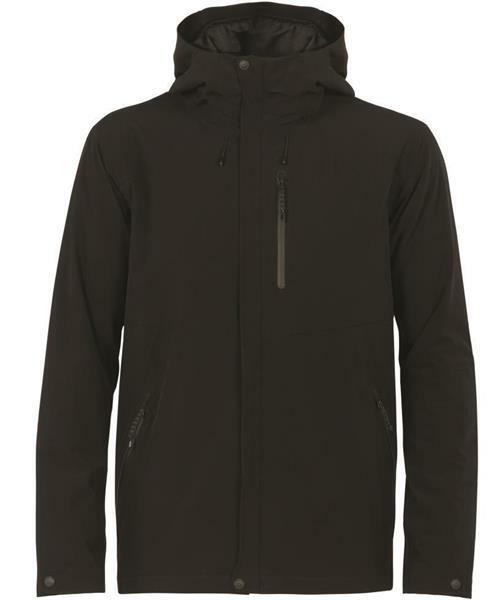 Stratus Transcend Hooded Jacket - Mens is rated 4.6 out of 5 by 11. Rated 5 out of 5 by Merinofanboy from Great Multi-use Jacket I love using this jacket for everything from night skiing to staying warm in the city. It keeps me warm and looks good. Rated 5 out of 5 by IntrepidPhotographer from Most Comfortable Jacket in my Closet I bought the Stratos Transcend Hooded Jacket to replace my last winter coat, and it has been performing beautifully. Now full disclosure, I run on the warm side so I combine this with my ice breaker 200 every day L/S and an Ice Breaker MerinoLOFT Ellipse Vest on the coldest of days. When its -5 to -20 degrees celsius, I personally find this jacket very warm. Most would need a heavier mid-weight layer to utilize this mid-winter. When the temperature drops below -20 celsius, I would add an Ice Breaker Decender L/S Zip and you wouldn't be cold. The lining on the inside of the jacket is the most comfortable. It feels like you are wearing a light wool t-shirt against your skin. This is not your typical feel from a lined waterproof jacket. (I've worked in outdoor retail for many years, so I have tested many brands.) The hood has ample room for any size head and is easily adjustable if you need to cinch it down tight. The sleekness of this jacket means I own a technical piece that will function outdoors but also be suited perfectly when going out for a nice dinner. Any marks or dirt on the jacket have been easily removed. Overall the jacket is performing well in all environments. It has shed any rain or moisture, kept drafts out and ultimately keeps me warm and dry. I will update my review once the winter as past to give you a detail on wear and tear. I am an avid outdoors adventure and photographer. I use my gear in both a personal and professional manner and need it to stand the test of time and rough environments. I believe this jacket will not disappoint in those aspects. I am a huge supporter of Ice Breaker and their business model. I believe in supporting quality companies that bring awareness to environmental issues, as well as trying to change the social expectations of commercialism. Rated 5 out of 5 by Thom from Must buy Definetly recommend this jacket. It's a tight fitting jacket that is inbetween a hard shell and a heavy winter coat. Keeps yah warm but you may need something heavier for those -25 days. Rated 4 out of 5 by sashman from like it very much Overall very glad I purchase this coat. Somewhat surprisingly warm. Zipped up fully, excellent protection from wind, rain and snow. Only ick, a little tight for me under the arms (armpits). An extra inch or so where the sleeves meet the shoulders would be great allowing just that little bit of extra comfort. Rated 5 out of 5 by Fiqbal from Another winner I have a ton of icebreaker tops. Fit is great. Quite warm, looks good (wife approved!) Minor niggle that the collar zips up quite high in the front, higher than my chin. Good for keeping cold out but too high for general use on a not so freezing day. Rated 5 out of 5 by jgmq from Love this jacket Purchased for my husband. He loves this jacket - saying it is lightweight and comfortable while also being very warm. It is beautifully constructed and really sharp looking! So far he has worn it skiing and also as everyday wear - warmth without bulk. Rated 5 out of 5 by UrgeVan from City to slopes Great city jacket for colder winter days and passed the test on the slopes - rain or snow, keeps you dry and warm.